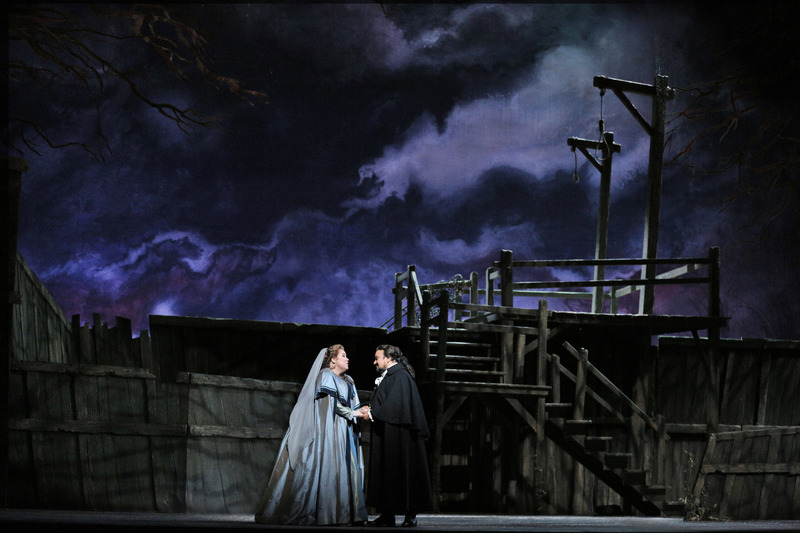 Julianna Di Giacomo as Amelia and Ramon Vargas Gustavus III in SF Opera’s production of Verdi’s “A Masked Ball”. Photo Credit: Cory Weaver. The twists and turns of plot in Guiseppe Verdi’s “A Masked Ball” are as convoluted and engaging as a Saturday matinee melodrama. Antonio Somma’s libretto is inspired by the historical assassination of King Gustav III of Switzerland, in 1792, less than fifty years before the opera’s premiere. In the early years of the 19th century, the subject of political assassination of kings was rather touchy and the opera ran afoul of the censors before it even opened. Indeed, in its premiere performance, all the characters had to be renamed and the locale reset (absurdly) to Boston, Massachusetts. But its effective dramatic sweep could not be denied and it was an immediate success. And passionate “A Masked Ball” is. 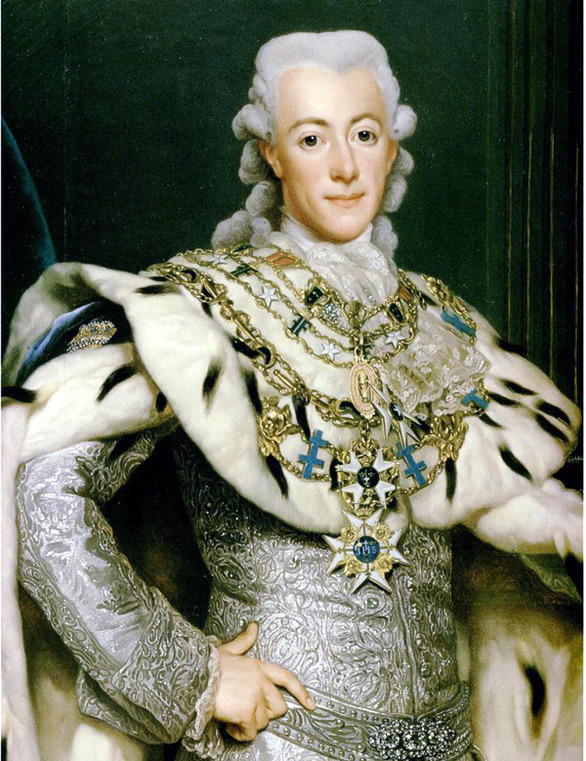 We are introduced to King Gustavus III of Sweden, who believes that political power must be used to benefit the people, or it cannot be called “just.” In return, he is beloved by his people, and Gustavus believes that their goodwill will protect him, even as his close friend and advisor, Count Anckarström, warns that enemies within the court are plotting to assassinate him. Another kind of trouble is lurking as well. As Gustavus goes about his royal duties with good cheer, he sings that “praise can sustain my glory, but not my heart.” He has been harboring a secret love for Amelia, Anckarström’s beautiful wife. When his page brings in the guest list for the royal masquerade ball, Gustavus is overjoyed to find her name. Gustavus is a man of the people, interested in justice, but he is also cavalier and heedless, a man who falls in love with his friend’s wife against his own better judgment. Which side of the king will prevail—the light or the dark? The San Francisco Opera production captures the themes of light and darkness in every aspect. The sets are invitingly atmospheric, starting with the light-filled castle court and its architecture reminiscent of the Arc de Triomphe, with tall upright columns bracing either side of the stage. The witch Ulrica lives in a dark haunt worthy of a Dickens novel, all dim and dusty, with clever lighting (by designer Gary Marder) that makes the sorceress’s shadow appear twice as large as any of her visitors who come to beg for her advice, including the king. Nicola Luisotti conducts the orchestra in a lively performance of Verdi’s score that completely supports Jose Maria Condemi’s direction, creating a musical chiaroscuro that combines the elements of lightness in the dark scenes and vice versa. 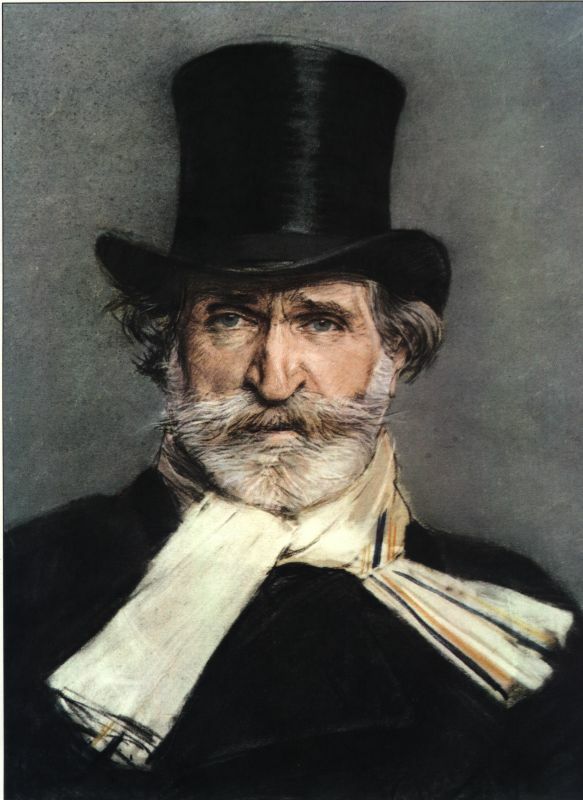 The effect of Verdi’s music is to perfectly mirror the contradictions within his characters, while adding a dash of humor in just the right places. The singers give ovation-worthy performances, especially Julianna Di Giacomo making her SF Opera debut as Amelia. Her voice trembles with fear and desperation as she begs Ulrica to help her quench the fire in her heart, but her soprano soars with passion as Gustavus begs her to favor him with her love. Ramón Vargas‘s tenor starts out a bit tentatively as King Gustavus, but grows into the role as the opera progresses. In the early scenes, his king is a lightweight and rather self-satisfied, but as his passion grows and he comes to understand the consequences of his unchecked actions, his voice also grows in resonance and emotional depth. In the end, he earns his right to his royal reputation as an enlightened ruler. Soprano Heidi Stober brings fun to the trouser part of Oscar the page, and Dolora Zajick is deliciously wicked as the witch, Ulrica. Stober’s energy lights up the stage throughout the evening, while Zajick makes the most of her single fortune-telling scene. In the roles of assassins, Samuele and Tommaso, Christian Van Horn and Scott Conner provide both menace and comic relief. “A Masked Ball” presents a tale where all of the characters are on the giving and receiving ends of love, betrayal, duty, and remorse, mercy, and redemption. Everyone has felt these emotions in their lives and the excellence of the SF Opera’s production makes it a pleasure to experience them again. “A Masked Ball” , music by Giuseppe Verdi, libretto by Antonio Somma. Produced by the San Francisco Opera. Director: Jose Maria Condemi. Musical Direction: Nicola Luisotti. Choreography: Lawrence Pech. Lighting Design: Gary Marder. Costume Design: John Conklin. Chorus Director: Ian Robertson. Amelia: Julianna Di Giacomo. Oscar: Heidi Stober. Gustavus III: Ramón Vargas. Count Anckarström: Thomas Hampson/Brian Mulligan. Ulrica: Dolora Zajick. Count Horn/Samuele: Christian Van Horn. Count Ribbing/Tommaso: Scott Conner. Christian: Efrain Solís. Judge: A.J. Glueckert. Amelia’s Servant: Christopher Jackson. Posted in Reviews.Tagged A Masked Ball, A. J. Glueckert, Ann Thomas, Christian Van Horn, Christopher Jackson, Dolora Zajick, Efrain Solis, Giuseppe Verdi, Heidi Stober, Jose Maria Condemi, Julianna Di Giacomo, Nicola Luisotti, Ramon Vargas, San Francisco Opera, San Francisco Opera Reviews, Scott Conner.